Even a dedicated neurobiologist would be hard-pressed to describe Aplysia as aesthetically attractive, but another popular invertebrate species used in studies of learning and memory is a clear winner in any molluscan beauty contest. With its bright coloration and striking profile, Hermissenda is the closest thing to a poster child available among the invertebrate species commonly studied by neurobiologists. Hermissenda is not just all looks and no brains, however. This system has been used to study the cellular and molecular basis of a particular form of associative learning exhibited by the animal. Hermissenda are normally phototactic; that is, they will move toward a lighted area. However, if the animal is trained that light predicts an upcoming aversive stimulus, in this case turbulence in the water surrounding the animal, the normal phototactic response is suppressed. The laboratories of Dan Alkon and Terry Crow have been instrumental in discovering the neuronal circuitry, cellular physiology, and molecular mechanisms underlying this form of associative conditioning. Image copyrighted by Mike Johnson. Used with permission. 4fe will discuss several of the biochemical mechanisms underlying the short- and long-term modification of this behavioral response. Motor learning, skills, and habits are the classic examples of unconsciously learned and unconsciously recalled memories. Walking is a good example. Walking is an extremely complex task involving intricate motor movements, which we generally perform automatically and with great facility. We learned to walk unconsciously as small children, and if anything trying to exert conscious control over our walking as adults likely leads to an awkward gait. Another example of unconscious learning is learning to play an instrument such as the guitar or piano, at least as concerns the motor components. Repetition allows the development of finely tuned motor patterns that can be recalled without conscious thought. Learning of the motor components also occurs without much conscious control, although certainly there is conscious involvement when the initial motor patterns are beginning to be laid down. Even in this case, though, one does not consciously work out the pattern of firing of individual muscles; indeed, by and large, we don't have very much control over the contraction of single muscles and are not really conscious of them as single units. When we learn to play an instrument, a multitude of complex muscle contractions and hand movements are taking place completely below the level of conscious thought. While complex unconscious processes go into the initial establishment of learned motor patterns, in some cases such as speech and walking, there is probably also a complicated interaction of developmental processes with signals generated in response to environmental stimuli. As mentioned earlier, in early stages of many types of motor learning, there is conscious involvement, the need for which disappears over time as part of the learning process. The circuitry and cellular mechanisms underlying motor learning are quite complex, involving the motor cortex, basal ganglia including the neostriatum, and cerebellum. We will not deal much with mechanisms of motor learning in this book. However, in later chapters, we will touch briefly on some forms of cerebellar synaptic plasticity, which is probably relevant to some forms of motor learning. The site of memory storage for most types of motor memory are not clear but, of course, in some way, must involve or have access to the principal circuits that mediate the behavioral motor pattern, such as the motor cortex, basal ganglia, and spinal cord motor neurons. A discussion of these systems is not within the scope of this book, so I refer the reader to any of a number of good reviews and textbooks dealing with this area (Chapter 13 of reference 4 is a good place to start). Some motor memories are subject to limited conscious recall, but in most cases trying to replay a motor memory with too much conscious control simply messes things up. This is likely a component of the common "choking" component of sports, although stress-induced release of modu-latory neurotransmitters, which affect performance, is also certainly a factor. It is interesting that the unconscious aspect of motor recall has made it into popular sports lingo. When athletes are at the top of their game, they are typically referred to as being "unconscious." The forms of learning we have talked about so far are nonassociative. In habitua-tion, sensitization, and the like, nothing is learned about the relationship or association of one event with another. We next move on to a more complex form of learning where a predictive relationship is learned—an animal learns that one environmental stimulus reliably predicts another. FIGURE 9 Ivan Pavlov and one of his canine subjects. Pavlov pioneered the study of associative conditioning, studying modification of reflex responses in dogs. Image courtesy of the Alan Mason Chesney Medical Archives of the Johns Hopkins Medical Institutions. rigorously documented and studied, was that he could train dogs to associate a neutral stimulus, such as the ringing of a bell, with the food stimulus. Over time, the dog would form an association between the bell and the food, and Pavlov found that the bell alone would ultimately cause a salivatory response just like the food did. The bell-elicited salivation was termed the conditioned response (CR), and correspondingly the bell tone was termed the conditioned stimulus (CS) (Figure 10). 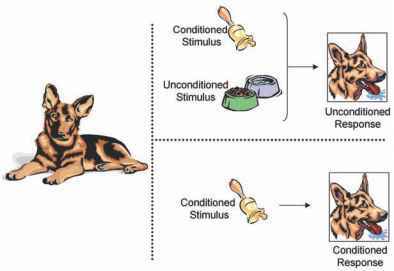 In associative learning, an animal learns the predictive value of one stimulus for another, in Pavlov's example the reliability of a tone for predicting a subsequent food presentation. This type of learning is profoundly important for survival in any natural environment and, for this reason, has been robustly selected for in animal evolution. Stated another way, associative learning allows the neural encoding of cause-and-effect relationships. The stable formation of a memory trace, such that an accurate record of cause-and-effect relationships is available for future reference, provides such a pronounced competitive advantage that this form of learning is typically quite vigorous. The importance of this last point cannot be overstated! Nature has selected for a robust capacity of nervous systems to accurately reflect one of the principal physical laws that govern the real world: cause and effect. Thus, nervous systems of all sorts have evolved, to the best of their capacity, sophisticated and robust circuit, cellular, and molecular mechanisms to encode these types of information. FIGURE 10 Pavlovian associative conditioning of the canine salivary response. Repeated pairings of an auditory cue with food causes the animal to learn the predictive value of one for the other. See text for details. monkey who learned that certain visual stimuli predicted the subsequent arrival of a food reward. However, the animal also "learned" that it was necessary to wave his hand in an idiosyncratic way in order for the food reward to be delivered. Of course, in reality, the hand movement was entirely superfluous to the task and the reward delivery. B. F. Skinner recorded several similar circumstances in training pigeons in associative learning tasks, where in some cases elaborate but unnecessary motor patterns were executed before the animal pecked an object to receive a food reward. Skinner termed these behaviors "superstitious" behaviors, a somewhat loaded term that is anthropomorphic but not without appeal. Regardless of the terminology, it is clear that these are examples of associative learning gone awry. Presumably what has happened is that, early on in the training, the animal has erroneously associated some movement on their part with the food reward and formed a lasting but inaccurate memory that executing the movement is necessary to receive the reward. I bring up these examples as indications of the robustness of associative memory, but with the interesting twist, that as with all robust systems, there is an attendant possibility of error-proneness. Against this backdrop, it is then interesting to consider that associative learning depends on two attributes of the environmental stimuli—contiguity and contingency. Contiguity refers to the property of the stimuli occurring co-incidentally, that is overlapping in time or one immediately after the other in time. This captures Nature's rule of cause and effect. Environmental stimuli generally are perceived simultaneously with or immediately after the events that cause them. Contingency refers to the ordering of the stimuli—that one stimulus consistently precedes the other in onset. This captures the predictive value of one event for the other; that is, in nature the cause will always precede the effect. In the examples of mislearning in the previous paragraph, the animals presumably misrepresented contiguous stimuli as also being contingent. We will return to contiguity and contingency in subsequent chapters as we delve into the molecular underpinning of learning. This is one of the areas where molecular studies have begun to yield great insight into the molecular mechanics of unique biochemical events that can be triggered by stimuli that are contiguous— close to each other in time or overlapping in time. Also, much new insight is being gained into how molecular systems can deal with the issue of order-of-pairing, that is contingency. In my mind, these examples are where the best case can be made for the beginnings of an understanding of the molecular basis of cognition. FIGURE 11 Delay and trace conditioning. Associative conditioning falls into two broad categories—delay conditioning and trace conditioning. In trace conditioning, an intervening time interval is introduced between the termination of the CS and the onset of the US. Trace conditioning involves the hippocampus. conditioning protocol experimentally. For example, if one is training an animal to learn that a tone predicts a food reward using a delay conditioning protocol, the tone is started and maintained continuously until the food reward is presented. Thus, the onset of the CS is followed by a delay before the onset of the US. With delay conditioning, the CS and US are contiguous and overlapping—in other words, the animal receives a US simultaneously with a CS after the CS has been presented continuously for some delay period. Trace conditioning refers to a conditioning protocol where the CS is presented, terminated, and followed after some intervening period by the US. The CS and US never overlap in time and are temporally contiguous in the sense that they are presented closely in time but never simultaneously. The term "trace" arises from the fact that some memory trace for the CS must be preserved over time so that it can subsequently be associated with the US. The distinct use of the two terms "delay conditioning" and "trace conditioning" may seem like the typical scientific hyper-semanticism because the two protocols seem so similar. However, the reasonably subtle alteration of introducing a brief intervening time-span between CS and US brings entirely new neuronal circuits to bear on the cognitive processing involved. Indeed, trace conditioning requires the hippocampus, whereas delay conditioning does not. The hippocampus-dependence of trace associative learning has been largely studied in rodents, but recent elegant studies in Larry Squire's lab have demonstrated that humans with hippocampal lesions also have deficits in trace associative conditioning (7). Thus, delay and trace conditioning differ fundamentally in their underlying anatomy and relevant circuitry, so much so that they indeed are quite different forms of learning. For this reason, making the reasonably small move from delay conditioning to trace conditioning progresses us from one category of learning to another entirely. The recall of trace conditioning has mapped onto it a temporal component as well. Re-experiencing the CS after trace conditioning has occurred allows for conscious recollection of the US, during the "trace" period. For example, let's say that I am trained that a tone preceeds a foot shock by 5 seconds. During testing, when I hear the tone, I have 5 seconds during which I am expecting the foot shock to be delivered. Because of this aspect, I have chosen to use trace conditioning as the first example of learning that can occur unconsciously but can be subject to conscious recall (see Figure 2). We will explore trace conditioning and similar forms of learning subject to conscious recall at many places in this book. Before proceeding to the cellular and molecular details, however, I will review the remaining major categories of learning from a behavioral perspective. Pavlov's dogs were passive participants in their learning experience. That did not have to do anything beyond perceiving the environmental stimulus, after which natural reflex took over and an unconscious sali-vatory response occurred. This type of learning is distinct from learning paradigms where a voluntary motor response is elicited. Conditioning where the animal is required to execute a motor response is referred to as operant conditioning. It is important to bear in mind that the distinction is a practical one based in experimentation. Operant conditioning simply refers to the fact that the experimenter is quantitating a voluntary movement (not a reflex) as the behavioral output indicating that learning has occurred. The examples I used earlier, where monkeys or pigeons were required to push a lever or peck a button are examples of operant conditioning. Over the years, scientists have debated whether operant conditioning will use different mechanisms from classical associative conditioning, and whether operant and classical conditioning should really be considered as distinct categories. At this point, we don't have the final answer to this question, but suffice it to say that it appears that there is no compelling reason to think that operant conditioning will require unique cellular or molecular mechanisms—likely the differences will be confined to the types of neuronal circuitry involved. Two associative learning paradigms that are used extensively in the modern study of learning are conditioned fear (8, 9) and conditioned taste aversion (10). 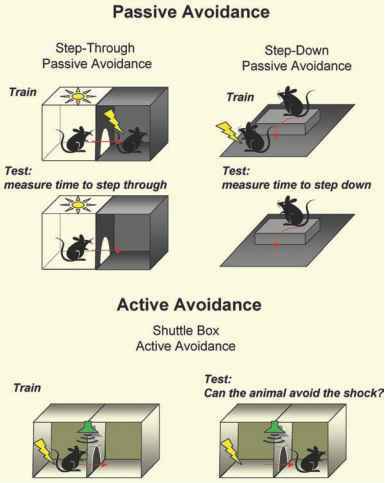 In both paradigms, animals learn an association between a neutral conditioned stimulus and an aversive unconditioned stimulus. Both serve as powerful examples of classical, Pavlovian conditioning, and both result in robust, long-lasting memory after even a single CS-US pairing. These two behavioral paradigms are also accommodating to researchers because the neu-roanatomical pathways underlying the learning are fairly well established. One specific example of fear conditioning involves the delivery of an innocuous acoustic cue (CS) paired with a mild foot shock (US) within a novel environment (see Figure 12). 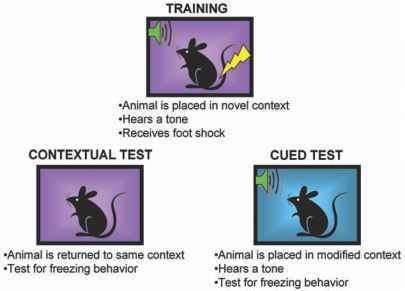 When tested 24 hours after training, rats, mice and other rodents exhibit marked fear, measured by freezing behavior or other reflex fear responses, in response to representation of either the context (contextual fear conditioning) or the auditory CS delivered in a different context (cued fear conditioning). Both cued and contextual fear conditioning have been shown to be dependent upon the amygdala, whereas contextual fear conditioning also involves the hippocampus. I will return to these two forms of learning in the next chapter where I discuss rodent behavioral models of learning in more detail. FIGURE 12 Fear conditioning. Fear conditioning is a form of associative conditioning in which an aversive, fear-evoking stimulus is paired with a novel environmental cue. A wide variety of environmental stimuli can be used for fear conditioning, including places (contexts), auditory dues, visual cues, and odors. Adapted from a figure by Joel Selcher. Conditioned taste aversion is another form of associative learning; in this case, an animal learns to associate the novel taste of a new foodstuff (CS) with subsequent illness (US) resulting from the ingestion of some toxic agent (see Figure 13). The adaptiveness of this form of learning should be apparent; by preventing subsequent ingestion of poisonous foods, survival is greatly enhanced. This is obviously a form of learning that is not very forgiving of multiple trials; not surprisingly, animals learn after a single pairing of novel taste and toxin to avoid that taste in future encounters. interval is typically on the order of seconds, with conditioned taste aversion the system can tolerate delays of hours between the CS taste and the US toxin. This suggests that there are cellular and biochemical events initiated by the taste stimulus alone that are likely to be long-lasting. Indeed, novel tastes alone trigger memory formation automatically, as can be measured by increased food consumption upon re-presentation of a foodstuff (Figure 13). This phenomenon is referred to as attenuation of neophobia, which we will return to shortly (11). FIGURE 13 Taste learning. Taste learning is a robust and automatic form of learning in animals. The two types of assessments generally used to evaluate taste learning are attenuation of neophobia, in which an animal learns that a taste is not dangerous, and conditioned taste aversion, in which an animal learns that a given taste is dangerous. These can be measured experimentally by giving a single exposure to a novel food on Day 1 (10 minutes of Nutri-Grain bar in this case) and monitoring the animal's response to re-presentation of that same stimulus 24 hours later (Day 2). If the animal finds the new food to be nonaversive, consumption of the food will be increased—attenuation of neophobia. 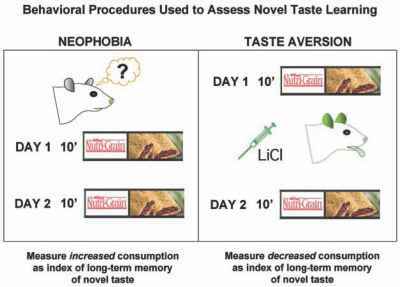 If an aversive stimulus is paired with the novel food (e.g., a lithium chloride injection), then the animal will exhibit a decreased consumption of the food on Day 2—conditioned taste aversion. See text and Chapter 2 for additional details. Diagram courtesy of Mike Swank. term used to refer to the third general property. Salience refers to the fact that animals do not, in general, learn to associate conditioned stimuli and unconditioned stimuli that are not typically paired in their natural environment. For example, nausea-inducing stimuli are by far much more robust producers of taste aversion than are generic painful stimuli that may robustly support other types of aversive conditioning. Similarly, pairing nausea with visual stimuli or auditory cues is not very effective at aversive conditioning to these stimuli. Clearly, evolution has operated to select for robust learning of associations that can occur in the natural environment. We describe this condition in terms of the stimulus being salient to the animal; in other words, the stimulus is likely to be pertinent to the animal under the given condition. Thus, in general, it is not the case that unconscious associative learning operates such that any two environmental signals can be associated. This likely arises from a combination of factors. First, there is a degree of anatomical specialization in the central nervous system (CNS) such that particular functions are parsed out into particular areas. Thus, as a practical matter the central processing of two environmental stimuli may never "touch" each other in the brain and, therefore, can never be associated. In this instance, the stimuli "touching" each other can be taken quite literally in that some anatomical cross-connection must be made. Conversely, for any association to take place, the underlying neural circuits processing the environmental information must be able to connect anatomically. It is only possible to draw an associative learning circuit if the two stimuli being paired impinge upon each other at some point. This seems like a statement of something that is intuitively obvious. However, my point here is that there is no such thing as an anatomical connection in the brain. There are only molecular connections. If associative learning requires that two information-processing circuits connect with each other, this connection must of necessity utilize molecular and chemical processes. A description of these types of processes, in particular molecular mechanisms that can contribute to associative events, is a central theme of later chapters of this book. Overall, we have seen in this section that various models of associative conditioning have transitioned us from unconscious processes to conscious processes. Many associations can be learned unconsciously and expressed unconsciously. However, various types of associative learning begin to recruit conscious processes as well. Even though they are learned unconsciously, they can be recalled consciously. As a generalization, the transition involves recruitment of the hippocampus into the learning process. In the following section, we will move on to even more complex forms of learning that also depend on the hippocampus. What is paramount in the recall of this sort of fearevoking stimulus.? What is contextual fear conditioning? What is the association between horror, fear and memory?